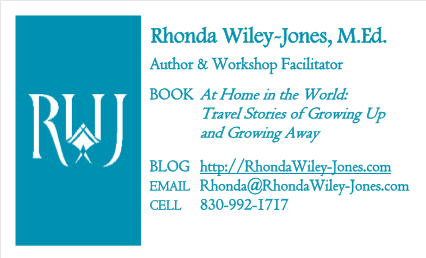 In a recent Travel Touchstones: Transformative Travel through Creative Jou rnal Writing workshop with lively participants, I explained that I developed the writing exercises as a result of not having the right kind of material from my journals when drafting my coming-of-age travel memoir, At Home in the World: Travel Stories of Growing Up and Growing Away. Why go to a “travel journal writing retreat” while traveling? Why not? What better time? Why not here (Isla Mujeres, Mexico) and now (February 7)? Get inspired to write your nightly notes or scribbled itinerary or captured conversations while in route. During the “Travel Touchstones: Transformative Travel through Creative Journal Writing” workshop, discover new techniques to trap your memories on paper in words and sketches. Share your journal writing experiences with other travelers. Explore multiple journal writing tools and techniques to use, as well as identify topics you might not have thought to pursue. You are on a break from your day-to-day routine. This is when you are more open to taking in new perspectives on your travel, your world back home, and/or who you are and want to become. Travel time provides the perfect circumstance for nourishing your creativity. You have more flexible time. Different scenery offers new outlooks. Various people (you might not otherwise spend time with) come and go temporarily from whom you can learn. Why not here and now? The Red Buddha yoga studio serves as lovely, soulful place for a writing retreat in Isla Mujeres, Mexico; February 7, 6-9pm. The three-hour workshop costs $50 USD (or equivalent pesos), a bargain for the fun of spending time with like-minded folks and for the years of enhanced journal writing experiences you will log. adventurers return home with stories that have transformed their thinking, actions, and perspectives. For more workshop information, click below. I invite you to go Candace Rardon’s website for her FREE e-book, “Travel Sketching 101” launch and giveaway. Even if you are not an artist, this is a lovely book with ideas for sketching–even for those of us whose artistic genius matured and ended in the third grade, like mine. I tell you about this because I believe her instruction book can greatly enhance our travel journals with images. Visual images, like words, help us collect and retain memories in our travel journals. REMINDER: I will hold a fun, interactive writing workshop on Isla Mujeres, Mexico entitled, “Travel Touchstones: Transformative Travel through Creative Journal Writing” on Tuesday evening, February 7, from 6:00-9:00 p.m. at the Red Buddha yoga studio, #22 Juarez Avenue. You will get to write from 2-3 different prompts, share, practice writing with all six senses, and develop techniques, topics, and tools. In the workshop, you will get to write 2-3 different entries from prompts given, share, practice writing with all six senses, and develop techniques, topics, and tools. If want to take advantage of this unique opportunity while traveling for only $50 (or equivalent pesos), please email me (rwileyjones@gmail.com) or complete the form below, as soon as possible to hold your place in the workshop. Pay on site.